Cam Lo, Quang Tri (13 May 2016) — An Explosive Ordnance Disposal (EOD) team from Project RENEW on Wednesday safely removed hundreds of unexploded weapons from an abandoned scrap yard in Thuong Lam Village of Cam Thanh Commune. The location was adjacent to the Rockpile – the former military observation post where U.S. Marines watched and tracked North Vietnamese troops infiltrating into South Vietnam through this section of the DMZ. The EOD quick response was triggered after Nguyen Van Ai, who works at Cam Thanh Commune People’s Committee, called the hotline number to report the emergency. Earlier, Ai had been alerted by an elderly man who lives next to the abandoned scrap yard that a group of villagers had unexpectedly uncovered some ordnance while uprooting an ornamental tree. Further excavation by EOD team members results in 710 items of unexploded 37mm rounds being found and removed from the abandoned scrap yard. At the edge of the abandoned house, the EOD team uncovered a total of 710 items of unexploded ordnance, identified as armor-piercing 37mmm rounds. Although the projectiles did not have the cartridge and driving bands which would have caused them to spin when fired, the weapons are still hazardous according to Mai Van Viet, Project RENEW’s Quality Assurance Officer. All of the projectiles were removed from the abandoned scrap yard and transported to RENEW’s demolition site for later destruction. In 2015, Quang Tri Province sustained four UXO accidents that resulted in three fatalities and four injuries, according to the Legacies of War Coordination Center. Most of the victims were involved in scavenging scrap metal. 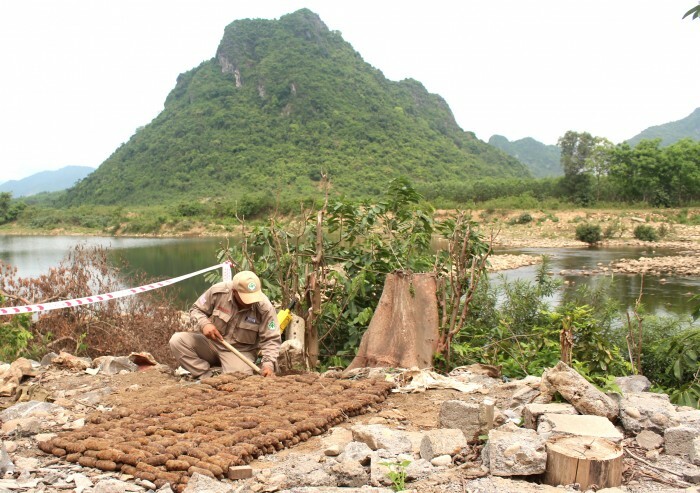 On 29 December 2015, two ethnic minority men, ages 23 and 30, were killed on the spot when they attempted to dismantle UXO for scrap metal in a forest at Vinh O Commune in Vinh Linh District. These victims might have disturbed 37mm high-explosive projectiles that were found scattered at the accident scene. During the five months of 2016, EOD teams managed by RENEW have conducted 640 EOD quick response tasks prompted by UXO discoveries called in by local people. The result is more than 3,000 items of UXO being safely removed and destroyed. Survey and clearance operations will be implemented until 2020 to identify contaminated land that needs clearance in Quang Tri Province. Meanwhile, it is important that EOD capacity also be sustained as a key part of overall risk management strategy, to deal with unexpected and random UXO that remain, as in this instance.